My thing is also, If it is expensive enough I going to keep a better eye on it. Not saying that better priced knives won't get the job done. This is what I prefer for something I car every day. I trust it, I care for it, and I take pride in how much use I have put into my benchmade. I have plenty of other kinves, most "cheaper" some more expensive. The thing is to find what works best for you. I like the benchmade pardue. It's super light, solid and good steel. I have liked kershaw and ka-bar in the past, but I lose them. I agree the beauty of a cutting tool is different for most people. I have a Spyderco, Crkt's, Gerber, and my older favorite Buck 110. All are never abused, but used. The cost and availabiity are so many out there. The Buck is what all teenagers carried around my rural youth. Leather sheath on a belt, no one thought terrorist. They worked in wood shop, electric shop, and lots of other things. My Wife gave me a 112 with finger grooves and carried it to give my older 110 a brake. While I was helping my Grandfather clean his garage, he found a China copy dated 1982 Kutmaster. (Buck copy) He gave it to me and said a guy in the mill sold him that for $5.00. I can't kill that knife and holds a sharp edge. Good luck on those $100 knives. My cheapies keep cutting, and do all I need done. If I do carry a knife it's a Spyderco Dragonfly. Cheap enough to not worry about, small enough to fit comfortably in women's jean pockets, and still cuts great. If you like smaller knives, I'd recommend one. My EDC for the past 2 years is this Kershaw Dash. $60-$75 depends where you look. Fits my hand perfectly, love the deep carry, and texture especially with cold or sweaty hands. I got mine at Blade HQ. Typically, I carry a CRKT M16 (which I can open as faster that any assisted opener), but if I'm wearing wool trousers & blazer, then I carry my Microtech OTF. Yep. Same here. $20 at Lowes. And impressively sharp for a factory edge. If I lose it, no tears. But my Leatherman Juice S2 gets all the REAL work. That bottle opener tool mostly; its better than the blade opening boxes via slicing the packing tape, and when I need to clean the adhesive off, I dont have to worry about cutting myself. No matter the cost of the knife I carry, which is usually $150 up to one at $800, I also carry a Leatherman Surge to do all the chores that a knife is not designed to do. As stated earlier, price is relative to each of us. My ivory inlay Sebenza would never go to work with me, but my Benchmade, Hinderer or ZT do. Facts seldom stand in the way of what someone wants to believe. I used a Spyderco Military with CPM S90V and carbon fiber scales to cut my dinner on Saturday and to sharpen a lot of colored pencils for my mom this afternoon (her electric pencil sharpener went belly-up). 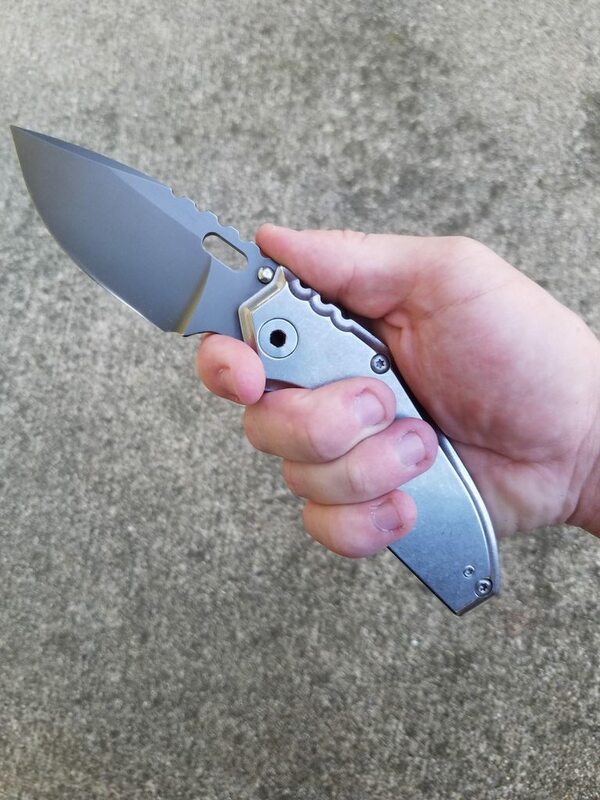 This is my EDC knife it is a Mick Strider Custom "Jibble" retail is $1,000+ for my purposes it is probably as close to a perfect knife as I have ever found. To my carrying a high end knife is about like the guns I like , it makes me happy to have the "best" available in certain categories. I have found it is allot easier to just write off the money spent on a knife and use it because you won't ever get any pleasure out of just letting a very expensive knife just sit there in a box for years never looking at it. That's why I thinned out my collection quite a bit over the last year. I have a microtech otf and a benchmade flipper that rotate as my edc. i Am not a collector and buy stuff that I like and will use. Reminds me of all these people have firearm safe queens.